Our government needs to see to it that our free markets work to the benefit of its citizens. We need more competition in the health insurance industry; not less by giving the power to the government. Where does it say that markets will work more efficiently with fewer competitors in the marketplace? 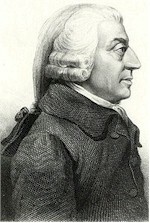 When Adam Smith talked about "rational self interest” and competitive markets in his book Wealth of Nations he envisioned many consumers interested in buying goods and services from many producers. This “free market” system best serves the private and public good. He was not talking about producers, insurance companies, controlling markets and being too big to fail. As a nation that was founded by mostly Christians, one of our core principles is that it is a morale obligation of those that have been blessed with superior talents and gifts to help the needy. This includes providing basic health care to those who are in need but not in a position to afford it on their own. Christianity is not the only religion that preaches this belief. One of the basic Pillars of Islam as stated in the Koran is Giving Zakat which means ‘giving a specified percentage on certain properties to certain classes of needy people. Our core value of helping our neighbor is why we needed to improve our health care system. Now we must decide what is the best way to do it. Another reason is that it is presently inefficient. The government is not protecting the free market to allow it to contribute to the solution..
Lord Acton, the British historian, said in 1887; "Power tends to corrupt, and absolute power corrupts absolutely. Great men are almost always bad men." In our country, the entity having the most power is our federal government. Our founding fathers were wise enough to create three branches of government in an attempt to dilute this power. Abraham Lincoln said that we are a "Government of the people, by the people, for the people, ..................". The federal government should not be overseeing our health care system; but rather it should be taking steps to assure that the private market is regulated in a way that we accomplish our goal by utilizing the system that has made this country the most wealthy and innovative in the world. The role of government is to encourage more competition in the marketplace and regulate and incentivize it to assure every American is afforded basic health care. It seems that a significant number of elected officials want to walk away from the engine that has propelled this nation to greatness and wealth........ Free Enterprise. Give it the room to solve our health care issues and let government govern. Some activities are appropriate profit-making enterprises. Others are best serving society when they operate as non-profit organizations. We find it normal and acceptable for churches and libraries and the Red Cross to be non-profit organizations. It isn't sensible to profit from providing spiritual involvement, lending out books or helping in times of disaster. Neither should it be acceptable for organizations to make a profit on paying people's medical bills, especially when there is a good alternative. Why should private insurance companies pay for medical services, which are already expensive enough, when they add additional cost to provide their profit? Profiting from people getting sick through no fault of their own is like kicking a man when he's down. The government already collects taxes to pay for its activities; it could easily provide the same service as private health insurance companies but with reduced cost from the absence of profits. In some situations, the capitalist approach isn't suited to the job and should step aside in favor of the public non-profit organizations that can do the job better. Poor are better off without government provided health care? Well, as taxpayers we paid for Europe's health care through the Marshall Plan and today we pay for Israel's coverage. I have a serious medical condition but do not have health care coverage. Can you direct me to any group that will provide me with the health care I need? Please send me a PM with this info.